Less than 20% of Water Bottles Sold Annually in the United States are Recycled. See How Skywell® and Sharp Trying to Lower that Number | Industry Analysts, Inc.
Is the price we pay for the convenience of bottled water worth it? 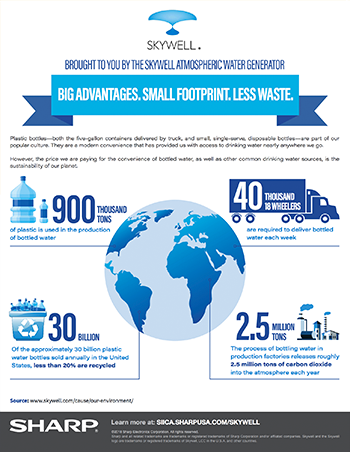 See how Skywell® is changing the sustainability of our planet through atmospheric water generation. This entry was posted in Sharp and tagged recycle, Sharp, Skywell, Water by IA Staff. Bookmark the permalink. ← Previous Previous post: Advanced Copier Technology Celebrates 35 Years! Next → Next post: Did You Know Digital Signage Encourages Customers to Spend 30% More in Stores?